Software developers can seem like a breed apart. They’re so very keen and precise in their psychological makeup that they make an excellent stereotype. But they also share very common features with the average person. Developers have to be very detail-oriented, very literal, and pretty intelligent to be able to write software in the first place. Logic is paramount and they share a passion for their craft that rises above the desire for more money. On the other hand, they are typically married, middle-aged and have children, and most likely a mortgage. The typical developer is a married, middle-aged male who has 2 to 3 children. Males have dominated the work force for as long Evans Data has been charting this (2001) and during that time they have accounted for anywhere from 84% to 94% of the workforce. The number of male developers is currently at a low, and perhaps more females will be taking up programming – we will have to see. Currently just 14% are female. Age is another interesting demographic. While globally he is doing an excellent job of not aging, in North America, where the median age of a software developer is now 36, he is getting younger and has been for the last three years. Age demographics shift depending on how many older people leave the work force as well as how many younger ones enter the profession. Notice in the chart below how North American developers eight years ago were by far the oldest compared to other regions. Note how developers in the Asia Pacific region were much younger. However this started to change in North America in 2008, and we’ve seen a steady downturn ever since. Of course 2008 and 2009 marked the start of the great recession in the U.S. Workforces downsized and older developers went into retirement either voluntarily or not. At the same time the popularity of mobile devices blossomed, capturing the imagination of younger people who began writing apps for sale through app stores or on their own. The result was a dramatic demographic shift. While those developers in Asia are slowly getting older due to a relatively new workforce that is now starting to age, they are still nominally younger than in other regions. 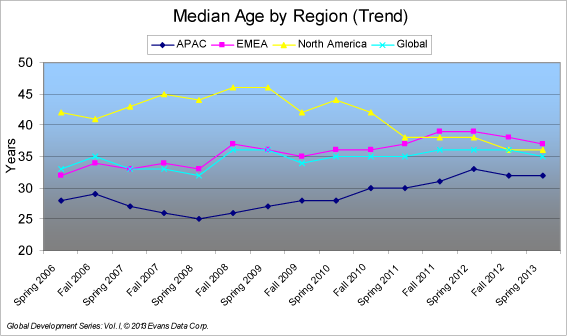 But with the North American developers now getting younger, the global developer ages are converging. In direct contrast to outdated stereotypes, developers tend to be family men; 71% are married and only 3% are divorced. While there are different ways to measure marriage and divorce since both are events in time as well as conditions, a 3% divorce rate is very unusual, considering that some projections for the general population in the US are more like 40% divorced. So, all told, developers are not the lonely, antisocial nerds that were portrayed in earlier years, nor are they free-wheeling socialites. In fact, almost two-thirds of them have between one and three children, while 32% are childless. Another hallmark of software developers is that they are well-educated. Programming doesn’t happen often without a lot of training and the recession only served to make more developers get advanced degrees. Eighty-eight percent of them have college degrees, about four in ten have Master’s, and another 5% have doctoral degrees. They are smart, detail-oriented and very literal, and logical. 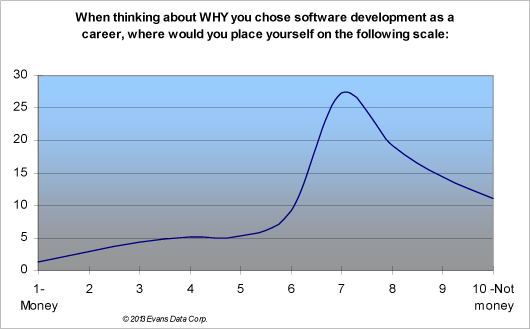 Developers seldom start coding because they are driven by monetary goals. They are attracted to the development process itself and would not switch careers even for a significant increase in their salaries. They worry most about their platforms or tools losing relevance to the ever-changing software environment, though as they get older they start to worry about their skills becoming irrelevant. They think of themselves, quite rightly, as being more logical than intuitive, but they also think of themselves as being moderately extroverted – not the introverted caricature we know from movies. One of the benefits to a population with such well defined characteristics is that they can make a very cohesive community. Developer Relations professionals who put together communities for some of the largest software vendors know of the challenges of building a developer program to support, nurture and grow a developer community. At Evans Data, we’ve also been studying this for years. Putting a program together is not rocket science. There are various elements that everyone knows a program should have, but running that program and shaping it to best fit the needs and desires of your developers is truly an art. We’ve pulled together a short white paper with advice gleaned from years of primary research on what NOT to do in a developer program. It’s a quick read with advice built on survey research from the developers themselves. Thank you for every other excellent article. Where else may just anyone get that kind of info in such an ideal method of writing?